A recent issue of Poets & Writers features the married writing couple Victor LaValle and Emily Raboteau. “Books and Babies,” the magazine says on the cover. How do writers balance it all? The article focuses on six writers: Raboteau, LaValle, Christa Parravani, Anthony Swofford, Fiona Gardner, and Uche Nduka. While each of these writers offer valuable insights about how their lives have changed since becoming parents, what the article fails to address are the practical concerns these writers face. In the six pages dedicated to the topic of “Books and Babies,” only one reference is made to “teaching schedules.” But this could mean many things. Are they adjuncts? Do they have tenure? Do all of them teach or do some of them stay home with their kids? Do some write full-time? Do they sell their plasma? Though the article repeatedly refers to “the demands of being an artist,” the specific nature of these demands is never named or explained. The article further neglects any discussion of daycare, babysitters, housekeepers, nannies, family support, help from neighbors or any of the other (often expensive) networks on which working parents have come to depend. While some attention is paid to the imbalance of demands placed upon female writers over male writers, just what those demands are and how these writers resolved them—by relying on family for help, by typing while breastfeeding?—remains unstated. We learn simply that these writers mustered energy and found that being “stuck in the house for the rest of the evening” helped to facilitate writing work. Rather than explore the financial challenges to being a writer-parent (and thus opening up a conversation about these concerns), the article focuses exclusively on the nonmaterial. We learn about these writers’ feelings (“complicated”), their spousal dynamic (“supportive partner with similar values”), the effect of parenthood on one’s writing (“motherhood changes one’s writing” and “made their writing better”), and concerns over the prospect of their children reading their work (“anxious”). How can we talk about “life with babies” if we don’t talk about the economic dimensions of the experience? When interviewing writers about this topic, I found that it is in fact not the disruption to writing time that worries writers the most. Rather, adding more financial demands to lives already defined by financial instability was a pressing factor. Many writers I spoke to would be unable to afford childcare. Whether Brooks is supporting herself and her family through her many books, articles, teaching, or all of the above is not clear. This emphasis on luck, or atypical circumstance, seems to imply that for the average writer hoping to balance income-earning work with writing and parenting, only one solution is available: be lucky. On the contrary, for the majority of writers who have kids or are thinking about having kids, balancing paying work with writing work while also raising a child is the entire story. Because the conversation about having children is often framed in terms of values and attitudes as opposed to economic conditions, many writers I have spoken to feel that the decision not to have children makes them appear selfish, self-absorbed, overly ambitious, or cold-hearted. Thirty-year-old Kelly Davio, author of Burn This House and editor of The Los Angeles Review, asked me, “Is it wrong not to invest energy in a child? Does it make me a bad person?” Similarly 48-year-old J. of British Columbia, who says that she’s felt that her “lifestyle was not very suitable to having kids” told me, “I guess in a way it is being selfish for my own goals in life.” And 37-year-old Ilan Mochari, author of Zinsky the Obscure, who feels that he would “be much more open to becoming a parent if I had disposable income and the time it creates” referred to his “next long handwritten draft” as “self-absorbed” in comparison to starting a family. Yet all of the writers I talked to, far from being selfish, have thought quite seriously about a potential child’s best interests. For many, writing time is not just a means to getting ahead in one’s career or to publish, but a necessity on par with food and shelter. All of the writers I spoke to worry about the quality of childcare they could provide, knowing full well that children are needing and deserving of such care. Of course, there is no one right answer for everyone. Each writer must make the writing life—with or without kids—viable in his or her own way. Still, any conversation about balancing parenthood with writing ought to include the specific circumstances of writers’ lives. About the author: Becky Tuch is the founding editor of The Review Review and a founding member of the literary blog Beyond the Margins. Her fiction has received fellowships from The MacDowell Colony, The Somerville Arts Council and awards from Briar Cliff Review, Byline Magazine and was listed in Wigleaf’s Top 50 Very Short Stories of 2013. Other stories have appeared in Hobart, Eclipse, Folio, Night Train, Quarter After Eight, and elsewhere. In 2011 and 2012, The Review Review was named “Best of the Best” among Writer’s Digest’s 101 Best Websites for Writers. She teaches at Grub Street in Boston. 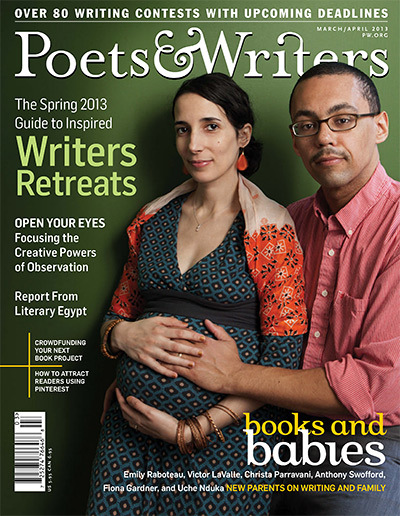 »A recent issue of Poets & Writers features writer Victor LaValle and his pregnant wife, Emily Raboteau. “Books and Babies,” the magazine says on the cover. How do writers balance it all?« So Mr. LaValle is allowed to be a writer in this opening, but Ms. Raboteau is not? Be fair, please. Ms. Raboteau should be called a writer immediately; failing that, Mr. LaValle should instead become “sperm-provider” in the first line. Seriously, there are at least 10 ways to let readers know these two individuals are writers expecting a child without falling into such a problematic introduction. Yes, we’re told Ms. Raboteau is a writer in the second paragraph, but that only reinforces the suggestion that her writing is secondary to her uterus. Thanks for the feedback, Andrew. We’ve updated the intro to avoid any implication that Raboteau’s writing is secondary in her life. Thanks for addressing this. I had similar reaction to the P&W article. Many times my writing students and/or editing clients – most have FT day jobs and children too – get depressed about how long it’s taking them to finish a project and are tempted to compare their situation to other writers who (to their eyes) seem to churn out a lot more material in less time. I have to remind them of all the ways many other writers are *lucky* – not needing a day job because of spouses who earn substantial salaries; parents /in-laws providing free childcare, or being able to afford childcare when school is not in session; teaching schedules that allow (and/’or make it mandatory) to write, etc. Yet, I’m also continually impressed by writers who have kids, day jobs, and even care for elderly relatives and still *find* (steal?) the time to write. Which makes me think that contemplating the impact of a child on the writing time/financial resources would put anyone off…yet once a family is formed, parents (particularly mothers) who are writers are extremely adept at incorporating the writing. Somehow, the writing gets done. More slowly, but that old expression (Need something done, ask a busy person) is something I see in action every day. Sometimes in my own house! Thanks for an engaging post. I had similar concerns about the Poets and Writers piece, and you do an excellent job of discussing that article’s failure to address the economic realities that most writer-parents face. That said, this post exhibits a bias of its own, as only authors who chose not to have children are interviewed here. Plenty of folks who aren’t particularly wealthy or “lucky” find a way to balance the demands of writing and parenthood. By failing to include these voices, this post presents the reader with a false choice. Thanks for sharing, Becky. I agree that the decision to have children–for writers and non-writers alike–is complex and personal, and yes, includes factors that include finances. However, I wonder how people define ‘financial stability’ in this conversation. Are we talking about providing (organic) food on the table? Private school tuition? The latest Uggs for our daughters? I find myself reacting to this post–and the Poets & Writers article–less as a new mother and more as someone who did not grow up with shared definitions of ‘wealth.’ Wow, that was a lot to type while breastfeeding! I think P&W didn’t address the economics because it’s a huge issue that affects people in all walks of life. Ann Crittenden does a really excellent job of laying it out her book *The Price of Motherhood. * Slightly off-topic, but there are some organizations that help artist-parents. This year the Barbara Deming Memorial Fund is accepting grant applications from poets and writers of creative nonfiction. (The money can be used for childcare.) The Sustainable Arts Foundation and Pen Parentis also offer grants. The economic challenges are very real for most of us, but, as Lisa says in her comment above, “Somehow, the writing gets done.” The nature of my blog series leaves it to each participant to share what they choose of their parenting/writing experiences. It’s interesting to note how seldom money issues are discussed. Perhaps because, as a society, we aren’t comfortable talking about our personal financial situation in so public a way? I suspect that’s why I shied away from it in my introductory post, though it wasn’t a wholly conscious choice. I agree, though, that a frank, open conversation about the various ways writer-parents are able to (or fail to) address the economic realities and make time and space for their writing would be useful. It’s a conversation I’d be glad to take part in. Argh. story of my life. Working full time, sending my first poetry manuscript out to contest. Meanwhile, baby is screaming his head off. Given that much of the literature on work-life balance is inherently skewed toward the assumption that that balance includes children, I for one was happy to be invited to comment in an article that focused on a minority who is told every day in myriad ways that our choice is somehow a confusion of priorities, and that basically we will come to our senses. And I take issue with the idea that everyone quoted in the article has chosen not to have children. I’m 38 now and still deciding with the added pressure of a clock winding down. It’s a deeply painful choice with a maze of shades of greys to lose myself in every month. Kudos to Becky Tuch for staking out some space for the minority view. P.S. Jenn, I didn’t mean to imply that your comments were dismissive! (You’re one of the most sensitive people to these issues that I know.) Rather, just pointing out that what’s really at stake in the conversation concerning ‘financial stability’ is not luxury items but basic goods such as housing, health care, etc. Interesting take on this topic. Although I dabbled in writing at a young age, I didn’t really start my career (if it can be called that) until I was already having kids. As a full time professor, my writing career has grown as my children have. It means that my writing time is highly scheduled with the help of a supportive spouse. Saturday mornings and early weekday mornings are for catching up on writing, completing revisions for my editors, and any professional correspondence. Creative pieces get written during summer and Christmas break (one of the blessings of academia) and revised/submitted during the school year. The one element that I find most challenging is trying to create a longer work. There just isn’t the time while my kids are young. It is also disappointing that I can’t run off to every conference or literary event that I’d like to because of practical matters. But on the upside, it does keep my writing time focused because I know it is precious. Thanks for looking at an important element of this issue. Having children is a personal decision for everyone in any job, and writers are no exception. I have a 3-year-old and the time I need to dedicate to her is enormous. I can usually squeeze a couple of hours a day out to write–and that’s without needing to work outside the home. So, yes, your writing time goes away very fast when you have a kid. That is one of the reasons we decided to stop at one child. I had always wanted 2, but after I had my first I realized that my few precious hours a day of writing would disappear completely with two children. And–selfish or not–I knew I did not want that to happen. I am most fulfilled when I can write, and I firmly believe that the best parents are those who feel fulfilled in themselves. And I also knew I would not be happy identifying only as MOM. I need to be someone outside of my maternal ID. So we’re sticking with one, and as much as it broke my heart to make the decision at the time, it is the right one for us. There are so many sentiments that I want to second here, particularly the idea that work-life balance is something that a lot of (most?) people struggle with (not just writers, and not just parents) and the notion that definitions vary (one example I’ll contribute: “financial stability” means something quite different to parents of children who have disabilities/special needs than it does to those with typically-developing offspring). And yes, it’s refreshing to see included here voices of writers who don’t have children, whether they may yet become parents or not. It’s funny, but every time I begin to write additional comments that might incorporate some of my own circumstances and deep (if sometimes conflicted) feelings about the matters embedded in this post and in other people’s comments, I end up dissatisfied with what I’ve written. Which maybe means that I need to find/take the time and mental space to really work through my thoughts in writing. We’ll see. Right now, my lunch hour (at a traditional full-time, year-round office job) is about to end!